Springtime Means it's Time for a Tune-Up! | Sound Heating & Air Conditioning Inc.
« Can a Heater Hurt Your Indoor Air Quality? Temperatures are generally pretty cool in our area. You don’t usually have to worry about a huge heat wave coming through this time of the year. Yet, now is definitely a great time to begin thinking about your air conditioning system. More specifically, you should be thinking about scheduling your next AC maintenance appointment. The last thing you want to do is get to the middle of summer and be stuck with a malfunctioning cooling system because you skipped maintenance. Not only is this inconvenient for you already, and uncomfortable, but you’re less likely to be able to get an HVAC technician to come to your home quickly as they’re more likely to be out on repair calls this time of the year. There’s no time like the present to schedule your next tune-up, but what will this do for your system? It’s probably hard to imagine a hot summer day right about now with our traditionally cool and rainy climate. However, if you’ve experienced even just one summer here, you know you don’t want to face it with a failing AC. The biggest benefit of scheduling professional AC maintenance is that it significantly lowers the chance of your system suffering from malfunctions or completely breaking down during hot weather. Here’s a statistic for you to illustrate this importance: Approximately 85% of the repairs an air conditioner may need during its lifetime are problems that come from lack of maintenance. This means that with annual maintenance, you can likely cut away 85% of the repair needs your cooling system may have. This saves you money and time in addition to giving you a peace of mind. There are more savings than just this, though! 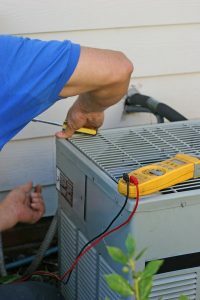 Maintenance protects your air conditioner from wearing down to the point that it breaks down on you unrepentantly. Your AC system undergoes a lot of strain over the summer, and we’d like to help prevent this. Maintenance makes it a lot less likely to need a premature replacement and it helps your air conditioner retain 95% of its original efficiency rating throughout its lifespan. With routine tune-ups, your air conditioner should be able to last about 10–15 years. Of course, this is also dependent on other factors, like what manufacturer your air conditioner is from and how on top of repair needs you are. But generally speaking, an air conditioner that doesn’t receive any sort of maintenance can probably be expected to last around 8 years. One last note: have you taken a look at your air conditioner’s manufacturer warranty? This warranty, for most cooling systems, requires professional maintenance be done annually. If a system doesn’t have this routine care, it can void the warranty. If this happens to you, you may get stuck with a large replacement or repair bill for a faulty air conditioner. While rare, about 2% of air conditioners leave the factory with some type of default. You shouldn’t have to pay the price for this! To schedule your next AC maintenance session, contact Sound Heating and Air Conditioning Inc. today. We take your comfort as serious as you do!